The already vibrant Low Countries Studies community in the North of England was given a further boost in October with the official opening of the Centre for Dutch and Flemish Studies [in the North] on the 27th of October. This research hub aims to bring together academics and students of Dutch and Flemish Studies in the North of England and serve as a focus for both scholarly and cultural activities. 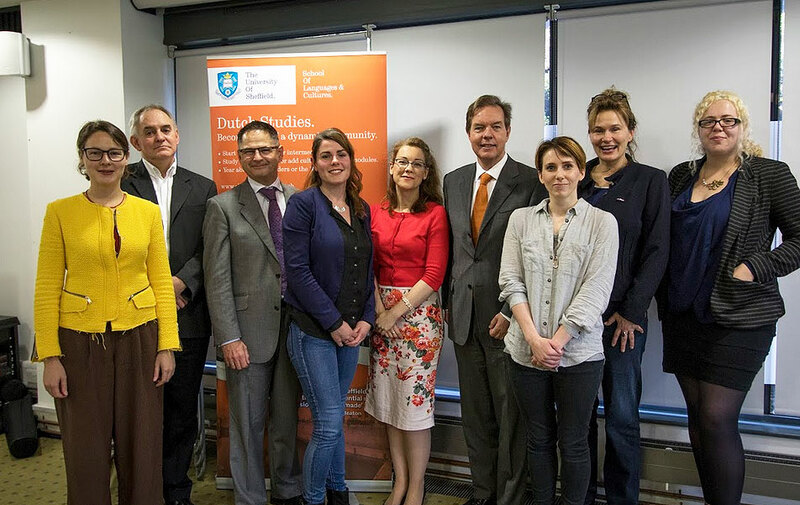 Based in the Dutch Section of the University of Sheffield’s Germanic Studies Department, the centre has already seen several events since its launch, which was attended by Dutch Ambassador to the UK Simon Smits. BA, MA and PhD students of the University of Sheffield presented their work in an overview of Dutch Studies at Sheffield. This was followed by a panel on languages and career development in which Dr Henriette Louwerse led a discussion between Ambassador Smits, Embassy Senior Communications Advisor Lauren Harris, postgraduate researcher and translator Jenny Watson (Swansea University) and Aimee Hardy of the Anne Frank Trust. Keep up-to-date with events at the Centre for Dutch and Flemish Studies [in the North], including research seminars and visits by guest authors on the Centre’s website.